2009-05-01. New. Ships with Tracking Number! INTERNATIONAL WORLDWIDE Shipping available. Buy with confidence, excellent customer service! 2009-05-01. Good. Ships with Tracking Number! INTERNATIONAL WORLDWIDE Shipping available. May not contain Access Codes or Supplements. May be ex-library. Shipping & Handling by region. Buy with confidence, excellent customer service! Wisdom Tree, 2008-01-01. Paperback. Used:Good. Wisdom Tree, 2009. Hardcover. New. The book tackles the complex theme of identity; it is a journey of self-discovery through the myriad human relationships that help us see things in perspective and in context. Written in the form of a graphic novel, it tells the story of Mandy, a second generation Indian, born and brought up in Chicago. He is as American as they come â hot dogs, French fries, baseball and love of all things American, especially blonde. He is, of course, no different from his clones who are in several other parts of the world â England and Australia, the Netherlands and Canada. They blend with their surroundings by assimilating the culture of their adopted home and denying their Indian roots and heritage. In the case of the hero of our book, he has even changed his name from Mandeep to Mandy! 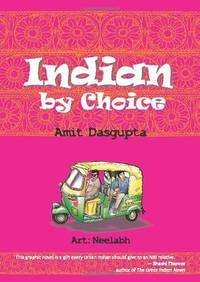 It goes on to capture his metamorphosis during a forced trip to India, at the end of which he chooses to be an Indian by choice. Printed Pages: 100. Wisdom Tree Publishers. Hardcover. 8183281362 Please allow 4 - 14 business days for Standard shipping, within the US. Thank you for supporting our small, family-owned business! . New. 2015-02-25. 0. Wisdom Tree Publishers. Hardcover. 8183281362 Please allow 4 - 14 business days for Standard shipping, within the US. Thank you for supporting our small, family-owned business! . Fair. 2015-02-25. 0. Wisdom Tree. Hardcover. New. Special 20% discount on this book. Wisdom Tree. Hardcover. New. Special 30% discount on this book. Wisdom Tree, 2009-05-01. 2009. Paperback. Used:Good. Wisdom Tree, 2008. Softcover. New. The book tackles the complex theme of identity; it is a journey of self-discovery through the myriad human relationships that help us see things in perspective and in context. Written in the form of a graphic novel, it tells the story of Mandy, a second generation Indian, born and brought up in Chicago. He is as American as they come â hot dogs, French fries, baseball and love of all things American, especially blonde. He is, of course, no different from his clones who are in several other parts of the world â England and Australia, the Netherlands and Canada. They blend with their surroundings by assimilating the culture of their adopted home and denying their Indian roots and heritage. In the case of the hero of our book, he has even changed his name from Mandeep to Mandy! It goes on to capture his metamorphosis during a forced trip to India, at the end of which he chooses to be an Indian by choice. Printed Pages: 100. Wisdom Tree, 2009-05-01. Paperback. Good. Wisdom Tree. Used - Good. Shows some signs of wear, and may have some markings on the inside. Wisdom Tree. Used - Good. Good condition. Scb Distributors. Used - Very Good. Very Good condition. Wisdom Tree Publishers. Hardcover. 8183281362 Unused Like New . Fine. 2015-02-25. 0. Wisdom Tree. Hardcover. GOOD. Spine creases, wear to binding and pages from reading. May contain limited notes, underlining or highlighting that does affect the text. Possible ex library copy, thatâll have the markings and stickers associated from the library. Accessories such as CD, codes, toys, may not be included.